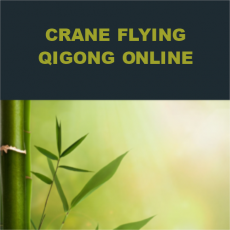 Crane Flying Qigong is a beautiful and dynamic style of Qigong exercise incorporating breathing, movement, and powerful visualizations for clearing out blockages and bringing in healing energy for the whole body. There are five distinct sections within this set that we will cover during this course. This style increases sensitivity to feeling energy and also improves balance. No experience needed! This course is a simulcast of a live course offered at the Qi Gong Instutute of Rochester. Online students will be able to view the class live but will not be on-screen during the course. Online students will also have access to the recordings of each class in this series. Questions can be sent in by email. Session is Thursdays 1:30-2 pm beginning Dec. 6, 2018. Note: no class Dec. 27, 2018.